Just like last year, I decided a great way to kick off the new year would be with a few days of raw food. It’s day 2 and I’m feeling great. It’s not a permanent lifestyle choice for me, but a great place to go back to whenever I need it. The holidays usually leave me feeling a little gunky, so I decided to do full raw for 3 days. I mostly used my Raw Food: A handy guide for every meal of the day book as a guide for the recipes for day one. (Except dessert, see below.) The nice thing about making meals like this is, it’s extremely easy to improvise and adapt the recipes. I have other raw books now, but this was the 1st one I ever purchased. It may come off as simplistic for some, but the servings are generous, and the recipes, though not extremely abundant, are easy and taste good. Though I love eating this way, and there are certainly times when we eat high raw for month periods at a time, produce is expensive. That said, we’ll be going back to eating lots of cheap protein like grains, beans, and legumes after this. 🙂 Speaking of finances, mine should be improving fairly soon though. I start my orientation for work in a week and a half on Monday, January 14th! Which is great because I really want to buy my ticket for this year’s VidaVeganCon in Portland before they sell out! Just look at the amazing list of speakers!! I bought enough buckwheat groats to last us for about 4 breakfasts. These are cheap enough out of the bulk bins. I soak the amount we need overnight (or in this case for a few days, rinsing daily) and then combine it with apples, cinnamon, dates and a little water. For lunch we had this delicious spiced carrot soup. 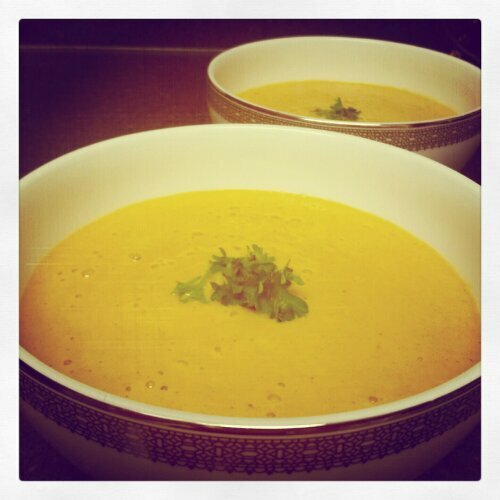 A fairly modified version of Raw Food’s Holiday Season Carrot Soup. Orange juice, carrots, grind of sea salt, dates, figs, cloves, cinnamon, ginger and almonds. Even though I’m kind of over anything tasting too “holiday” right now, it was tasty. 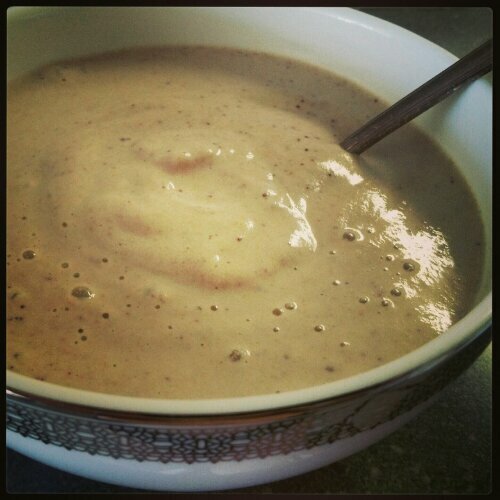 I ran it in the Vitamix until it was warm-hot. 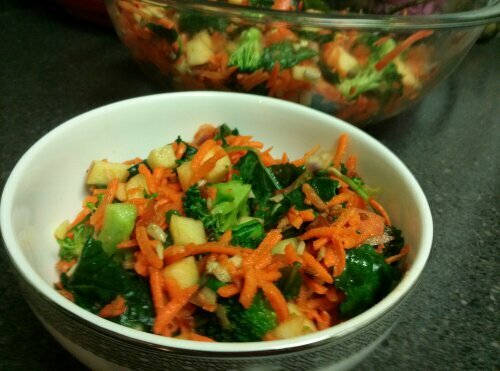 For dinner, I added some baby kale to this carrot salad, which I had made before and loved. 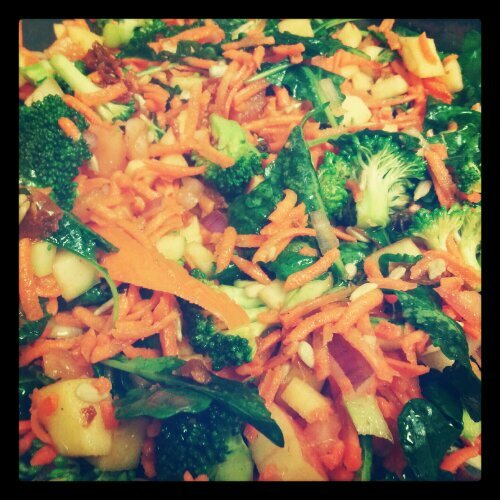 It also had broccoli, tomato, apple, sun-dried tomatoes, raisins, carrots, sunflower seeds, olive oil, lemon juice, salt & pepper. 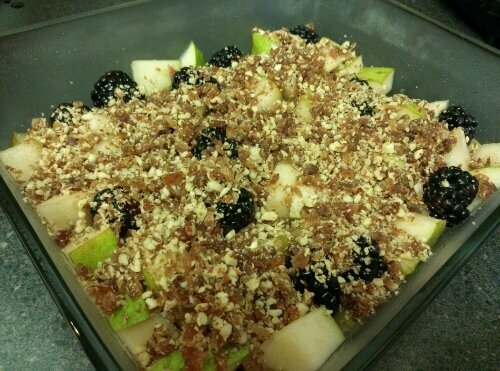 I made this Pear Blackberry Cobbler, based off of some of Ani Phyo’s ideas in her raw dessert book. Her formula seems to be about 2-3 fruits like peaches, pears, nectarines, apples with a little agave and maybe a spice and a crumble consisting of equal parts nuts/dried fruit with a bit of salt. I prefer the fruit cut smaller instead of sliced, and thought the salt was a little too much, so I cut it back for the cobbler I made tonight, but I’ll give you the recipe below with the adjustments I made! It was just delicious. We ate all of it! 1. 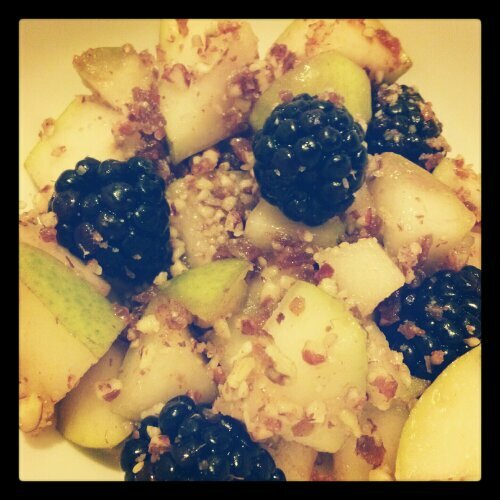 Combine pears and blackberries in a 2-3 quart dish. Drizzle with lightly with agave and toss until mixed. 2. For the topping, add pecans, dates and salt to the small bowl of a food processor and pulse until crumbly. Sprinkle on top of fruit. ← Winter Holiday Wrap-up: Holiday Feasting & A kitten!